Patience is not one of my greatest virtue. That was why I was surprised that I found joy in baking this masterpiece. Although I intended to make cupcakes at first since it’s less the works and I have more chances of success, this project was all worth the effort. It was not only me who waited with anticipation, the kids were there watching the cake with wonder, “is that strawberry cake mommy?” was the question repeated for the whole hour. 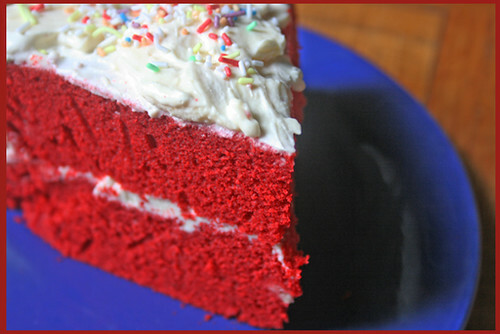 Red Velvet cake is said to have originated south of the US. There are many speculations but there’s just nowhere to point, just like other legendary foods that made us wonder and crave…well, go ahead and just eat it, we can research later! Originally, beets were used to color this reddish treat, but red food coloring has replaced it long ago. Other common ingredients are buttermilk, butter, flour, cocoa and is normally finished off with white icing, usually of cream cheese. I am not so sure about the sweetness of this particular recipe, I didn’t put in buttermilk but it still turned out moist. Some recipes include coconut flakes for the icing, since my “customers” are kids, I opted for candy sprinkles. 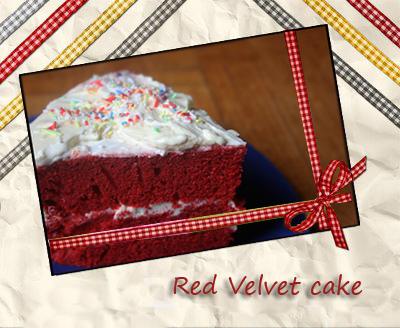 For now, I am posting the ingredients of the other Red Velvet cake I’m planning to bake…directions will be posted soon. Happy RT! Join us by clicking the badge below. The cake is a fine ruby, the red pastry looks delicious. The cream cheese frosting must be wonderful. I can gain weight by merely looking, but hey – cake this good is worth it! I haven’t had Red Velvet Cake in years. Very nice. I had my first real and genuine red velvet cake while visiting some folks in the tiny town of Clarks Hill, South Carolina. Life hasn’t been the same since! Thanks for the recipe. 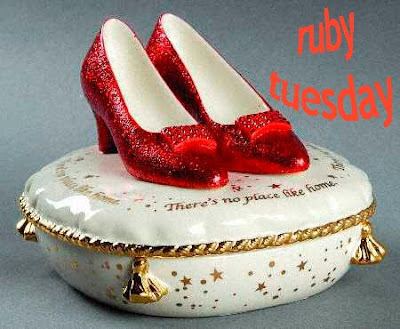 Love red velvet cake, will try this recipe, thanks, Have a great ruby day. thanks for the recipe 🙂 that looks really yummy! That is one pretty and delicious red entry. Hats off to you for making it. 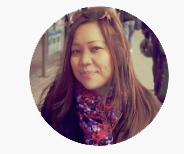 You asked a question on my blog”Nihonjin desu ka?” No, I am not Japanese, but I do love the Sakura festival. I have a lot of Japanese items and books on the Sakura festivals held thoughtout Japan. Thank you for stopping by.